On November 15, 28-year-old political activist Jeremy Hammond was sentenced to 10 years in prison and three years of supervised release at the Federal District Court for the Southern District of New York. This was the maximum sentence he could receive after his non-cooperating plea deal. He admitted to violating the Computer Fraud and Abuse Act with his participation in hacking the computers of private intelligence firm Strategic Forecasting (Stratfor). Before the sentencing hearing, an outpouring of support came from journalists, activists and other whistleblowers recognizing his act as civil disobedience and highlighting his motives of conscience and his commitment to the public good. Jeremy Hammond’s attorneys submitted over 250 letters addressed to the Judge asking for leniency. Along with friends, family, journalists and academics, the letters included one cosigned by 17 editors and journalists from international media outlets in fifteen countries acknowledging the importance of the material provided by Hammond. Hammond held an ideal for true democracy, where balance of power is an essential element and leaders are held accountable and working for the people. In pleading guilty to one count of conspiracy for hacking into the computers of Stratfor, he stated that “people have a right to know what governments and corporations are doing behind closed doors” and indicated clearly that he did what he believed was right. He revealed hidden structures of power where private corporations collude with government and where governments use corporations to hide their own egregious abuse of power and violations of the Constitution. If there were not people like Jeremy, Edward Snowden, Chelsea Manning exposing betrayals of people’s trust, then we would not know today the extent to which private individuals’ information is gathered, analyzed, and sold to private corporations and governments. We would not now be having the debate across the country about whether the NSA and private intelligence companies are going too far … That’s the discussion that Jeremy wanted to encourage. The information that has been posted on WikiLeaks has been an eye opener for many, who are realizing they cannot trust the government to protect their privacy. She took an enormous personal risk to leak this information – believing that the public had a right to know and hoping that her disclosures would be a positive step to end these abuses … I had to ask myself, if Chelsea Manning fell into the abysmal nightmare of prison fighting for the truth, could I in good conscience do any less, if I was able? I thought the best way to demonstrate solidarity was to continue the work of exposing and confronting corruption. Thomas Jefferson once said, “When injustice becomes law, resistance becomes duty”. Civil obedience is a last resort of democracy. It is a sign that the system is so corrupted and that reform no longer is possible. It is deeply tied to the spirit enshrined in the First Amendment, namely the redress of grievances. From Manning to Hammond and Snowden, in recent years we have seen waves of whistleblowers and individuals who act on behalf of transparency and the aggressive persecution of them that followed. This trend of civil disobedience and attempts to repress it is a sign of our final mile toward a police state. On top of the spying by private corporations that Hammond exposed, his case itself shed light on a larger problem; that the justice system itself is broken and we live in a society where idealism and conscience are being devoured while corruption and Stasi-like suppression are normalized. The fact that the judge deciding this hacktivist’s fate has an obvious conflict of interest (her husband was reported to be personally affected by the infamous hack), and her refusal to recuse herself from this case was never challenged except by the defense team and supporters. This shows how far we have gone down the road of unaccountable abuse of power. We can no longer pretend we have viable representatives or an independent judiciary. The justice system is bought and true justice that includes equal protection and prosecution under the law will never be delivered within this system. This broken system of law has been hidden from the public just as the level of collusion between private companies and government was hidden until it was brought forward by the leaked Stratfor emails. FBI entrapment was at the heart of this case and the Stratfor hacking was a sting operation to catch hackers. In his statement, Hammond noted the FBI’s deep involvement in the use of their informant, former LulzSec leader and informant “Sabu”, real name “Hector Xavier Monsegur”. He claimed that Sabu assisted in hacking the Stratfor website and thousands more around the world including countries such as Turkey, Brazil and Iran. In advance of Sabu’s sentence that was scheduled to take place on August 23, 2013, Hammond wrote, “What the United States could not accomplish legally, it used Sabu, and by extension, me and my co-defendants, to accomplish illegally”. The Hammond case itself revealed the government’s practice of outsourcing and coercion to go above or around the law. They outsourced in the same way the NSA mass surveillance is conducted with private tech giants such as Yahoo and Google and military operations are outsourced to private mercenaries such as Xe Services (former Black Water). The government celebrates my conviction and imprisonment, hoping that it will close the door on the full story. I took responsibility for my actions by pleading guilty, but when will the government be made to answer for its crimes? After Snowden’s revelations, no one can deny that the US government is the largest and most egregious hacker organizations in the world. Reports from the NSA’s secret files show how they tapped into Yahoo’s and Google’s cloud networks and targeted civilian infrastructure in Hong Kong and mainland networks such as universities, public officials, businesses and students. They have also hacked Mexican and Brazilian government emails as well as countless other governments’ communications for years, including the cell phone of German Chancellor Angela Merkel. These revelations show the overarching power of this national security state and confirmed Hammond’s claim of the US government’s hypocrisy for going after so called ‘hackers’ like himself. As the broken judicial system delivers further injustice, the mainstream media remains mute. Right after the hearing, Chris Hedges shouted outside the court house, “Where’s the New York Times? Where are the reporters?” noting the deafening silence. Two weeks after the court-martial proceedings of Chelsea Manning began, attorney Michael Ratner said: “To lock [her] up for even a day is to lock up the conscience of our nation”. 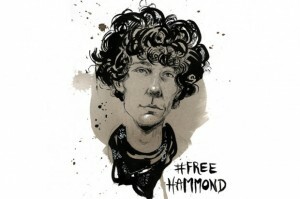 This 10 year sentence of Jeremy Hammond is also disproportionate to the crimes and is clearly politically motivated. This was another day when a young man’s conscience has been incarcerated. In that verdict, what was punished was his courage and idealism. That is what has been radicalized, criminalized and ultimately squashed by the powers that be. Now those who care about democratic values must ask the question; is it idealistic to want true and effective democratic processes in decisions affecting our lives? Is it idealistic to want transparency of powerful corporations and government? Is it idealistic to want to be who we are and act out of our own conscience? What Hammond holds as ideals should not be considered as just idealism. His idealism represents our right to be who we are. It is held simply as an ‘ideal’ when it should be how this nation and its government work, by actually respecting basic human rights and the Constitution. Even though this young transparency activist is locked up, his spirit and idealism will be carried on by those he has inspired and continues to inspire. Information he brought to the public continues to shed light on abuse by those in power. Right after the sentencing hearing, WikiLeaks tweeted: “Now that Jeremy Hammond has been sentenced, we will shortly release all remaining Stratfor files” and then began uploading the files on their site. “We must remember our whistleblowers; Chelsea Manning, John Kiriakou. Thank you for never staying silent even in the face of persecution. We must remember our hacktivist brothers and sisters; Wormer, Barrett Brown, Weev, the Paypal 14, the Payback 13, and all of the unnamed Anons who fight silently for our rights from the shadows. And of course, we must remember Jeremy Hammond … He is the reason a flame has been lit in so many of us”. For a detailed account of his sentencing hearing, read “A Dispatch from Jeremy Hammond’s Sentencing” and read Hammond’s prepared sentencing statement, as released by his defense team. This article was posted on Sunday, November 17th, 2013 at 4:51pm and is filed under Crime, Espionage/"Intelligence", FBI, Heroes, Internet, Media, NSA, Whistleblowing, WikiLeaks.